The remarkable thing about this piece of theatre is that this character, this person, this self-proclaimed “most famous white woman in South Africa”, is so totally part of our psyche and our history, that not for a moment do you not believe that Evita Bezuidenhout is not Evita Bezuidenhout and everything she says she is! The man behind the woman is not even a factor so brilliant is the creation! 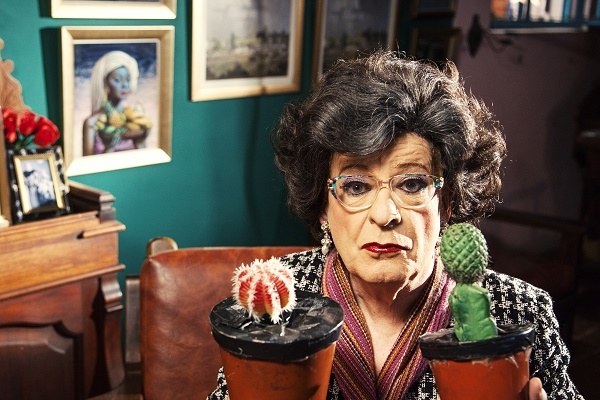 If you’ve never seen Evita Bezuidenhout before, this is the one you need to see! She’ll remind you of our absurd past and help you see the glimmer of hope that lies ahead. She is an optimistic South African and all it can do is rub off, if just a little! The Echo of a Noise A one-man memoir (4 performances only 14-17 June) is so much the more fascinating watched in tandem with Evita Bezuidenhoiut and the Kaktus of Separate Development! Try and get to see both! Evita and The Kaktus of Separate Development runs at Pieter Toerien’s Montecasino Theatre until 11 June and The Echo of a Noise then takes the last week till 17 June. 4 Performances ONLY!